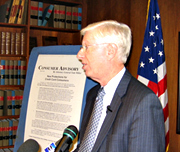 Iowa Attorney General Tom Miller says new protections for credit card users that took effect today should serve as a reminder to consumers to carefully read their monthly billing statements and shop around for the best credit card terms. The U.S. Credit Card Act place a number of limits on credit card companies boosting interest rates. Previously, the companies could raise a user’s interest rate with very little notice and apply the new rate to both future and previous transactions. The law also enacts new protections for underage consumers. Miller says people under 21 will now need to prove they’re financially independent in order to open a credit card account. “It says, basically, that you have to underwrite someone under 21. In other words, they have to have the ability to payoff the credit cards from their income. Or they can get someone older to cosign, which would have the liability as well,” Miller said. The new law also prohibits credit card companies from offering free items to students to get them to sign up for a card on or around a college campus. More details on the U.S. Credit Card Act are posted on the Iowa Attorney General’s website.